Where’d I Leave the Thing Itself is an exhibition of collaborations by Lilli Carré and Alexander Stewart, and includes animation, slide projection, and works on paper. 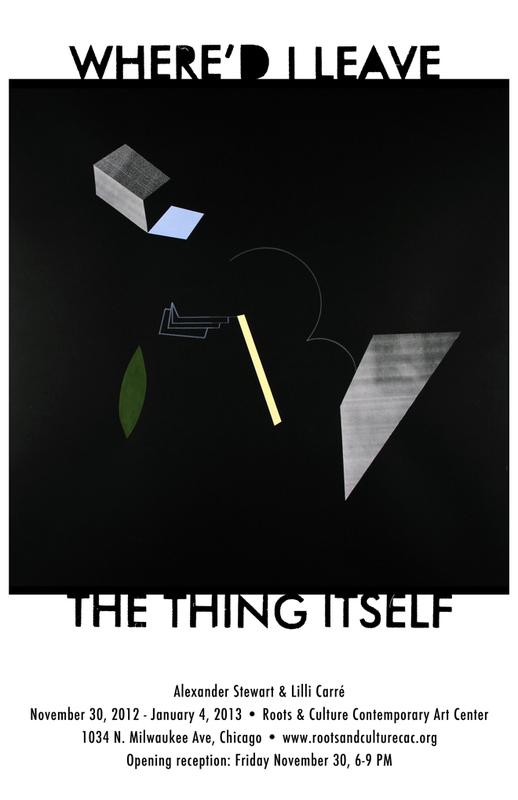 The show’s title is a result of a chance operation combining sentence fragments from Stewart and Carré, conjured by their piece in the exhibition, Poiple Phase. The centerpiece of Where’d I Leave the Thing Itself is Crux Film, a 5-minute looping abstract animation featuring alternating segments of work by Carré and Stewart. Using collage, paint and drawing, they animated arrangements of objects that struggle to maintain their shape, stay upright, or avoid disappearing. The work grows from a consideration of the idea that animation is fundamentally about creating movement. In one sense, these arrangements are working against this tendency, by holding precarious poses and struggling against entropy; while in another the arrangements are fulfilling this potential by allowing the suspended arrangements to enjoy kinetic moments of collapse. Working over the course of several weeks in shared studio spaces, these simple animated segments developed directly in response to one another; ideas, images, challenges and structures ping-ponging back and forth between the two animator’s light boxes. The companion piece to Crux Film is Poiple Phase, a double-projection 35mm slide installation. Two projectors combine drawings and text fragments from the two artists in a direct and literal fashion by projecting images on top of one another, through red and blue filters. Out-of-phase timers on the projectors create an effectively infinite number of combinations, producing unplanned juxtapositions of text and image. Carré and Stewart selected a set of the randomly generated combinations, and have featured them in an editioned artist book on view at the gallery. In addition to the two projected works, Where’d I Leave the Thing Itself includes several collaborative works on paper. Using paint, drawing, and collage, Carré and Stewart each added and subtracted elements in turn to create compositions through a back-and-forth graphic conversation. With these works on paper, now without the elements of time and chance operation, the artists focus explicitly and directly on fixing a collaboration as a still image.